I remember Steve as an amusing reconteur with a rapier like wit. We were debate partners on the LHS debate team( the debate coach never spent much time preparing us--so the team winged it for the most part). The gang (Steve, Phil, Rita, Jennifer and I formed) was enriched by Steve's presence. 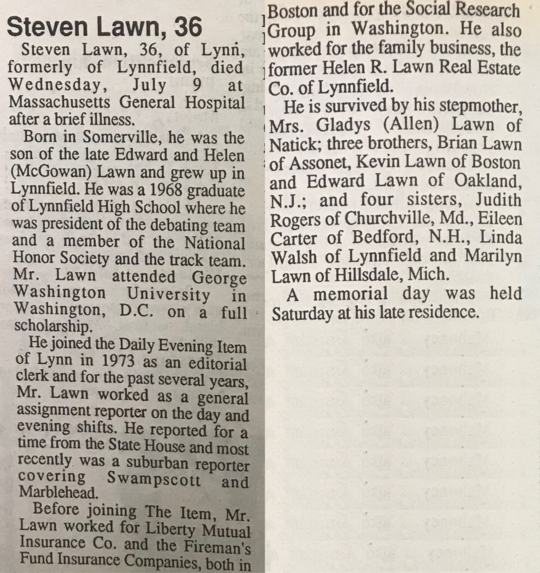 A Lynn Item columnist on Steve's death wrote about Steve's wealth of information and keen insight. He said that Steve should have had a column of his own in a newspaper. I too was saddened by this news. And so young. 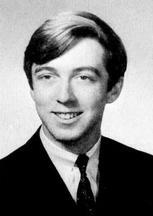 I was on the debate team as well and I remember him as smart and kind. I wish I had gotten to know the witty,fun side as well. RIP Steve. He was a good guy and fun to be with. I don’t think I was on that one, Ken. I left the team either after 9th or 10th grade. I do remember us all getting on the bus to go home after one tournament only to discover the driver was stinking drunk!! Steve was a neighbor of mine. I remember his sense of humor and wit and his whimsical, artistic way of looking at the world. Ken, as timekeeper, I was on that bus ride and never have been as cold as I was then. Perhaps that ride convinced me to avoid New England winters at all costs.